Kathleen Wildwood ~ Long Herbal Infusions: Why Drink Nourishing Long Herbal Infusions? This is a timely post from the lovely Kathleen Wildwood of The Wildwood Institute. David and I had the pleasure of attending many of her herb walks, classes and two wild edibles dinners hosted by Kathleen when we lived in Madison. I was just thinking about making a nettle infusion when her email came through offering permission to post her new article. During the winter, people ask me what they can do to make up for the generous consumption of sweets, beer and other comfort foods and drinks that people use to keep up their spirits in the dark of the year. Though you cannot make up for the impact of these foods on your metabolism, you can drink nourishing long herbal infusions to help replace the nutrients lost, reduce cravings for less healthy beverages and foods, and help heal all kinds of health issues all the year round. Nourishing long herbal infusions provide large quantities of calcium and other minerals, vitamins, essential fatty acids and proteins in their most natural form.They also contain anti-cancer phytochemicals and antioxidants, as well as unique combinations of specific nutrients for building healthy bones, supporting the immune system, calming the nerves, stabilizing blood sugar, improving digestion and more, depending on the herb(s) you choose. They are much more effective than nutritional supplements due to their superior absorbability. They are also safer and significantly less expensive! I have seen nourishing long herbal infusions, taken over time, heal the following health problems: osteoporosis, anxiety, adrenal burnout, eczema, diabetes, sinus problems, severe allergies, hormonal difficulties, infertility, joint pain, high blood pressure, and more. Please note that there are other herbal preparations that can be used to heal some of these conditions and that the choice of herb matters. However, all nourishing long infusions will provide large amounts of nutrition that cannot be obtained from teas or tinctures. Working with people as a practitioner over the last several decades, I have noticed that there is no single other food or beverage which can have such a powerful impact on improving health in everyday life, no matter what your health issues are. Drinking long herbal infusions helps people to have more energy and resilience during stressful times. People sleep better because they have enough nutrients to soothe and support their nervous system. Many a time I’ve had a client or student tell me that when they begin to drink nourishing long herbal infusions on a regular basis, their cravings for unhealthy beverages such as soda are reduced or eliminated. I have found that this approach of adding nutrition first, rather than cutting out all the “bad” foods, accomplishes the goal of greater health without as much trauma and struggle. Often, the craving for “bad” foods (usually stimulants and sedatives) occurs because the body is desperate to function without the nutrition it needs. Give it the nutrition, it doesn’t need the stimulants/sedatives as much. Why a long infusion, as opposed to a tea? Because you can get certain nutrients out of a dried plant only after soaking it in hot water for a long time. Scientific studies have shown that it takes at least four hours for a significant amount of minerals to extract into the water, and longer (up to eight hours) for roots, which are tougher and take longer to release their medicinal constituents into the water. If you make a cup of nettle tea (1-2 teaspoons steeped in hot water for ten minutes), you would get about 5-10 mg of calcium, but if you make a cup of nettle long infusion (1 oz. steeped in 1 quart hot water for a minimum of four hours), you will get over 200 mg of calcium per cup. And not just the calcium, but all the nutritional co-factors necessary to effectively assimilate calcium, because calcium by itself is not well utilized by the body. Not all herbs lend themselves to a useful preparation as a long infusion. A long brew makes some herbs unpalatable. This is nature’s way of saying you don’t need that much of those strong medicinal constituents, and that this preparation may even be harmful. As a young herbalist (if I had dared to call myself that in those days), I remember hearing about long infusions and thinking, yes, this is the way to go! So I made myself some St. John’s Wort long infusion. Can some of you guess what happened? I nearly gagged on the resulting brew – the word “vile” comes to mind! That is because St. John’s Wort contains a larger number of medicinal constituents that are stimulating/sedating, and a smaller number that are primarily nourishing – just the opposite of what we want in a long infusion. Although this particular herb is too strong (stimulating/sedating) to prepare as a long infusion, it does work quite well as a tincture. Herbs that are aromatic, intensely bitter or otherwise strongly stimulating/sedating are better as teas, tinctures or other preparations. Examples of herbs that are safe as teas but that could be harmful or even toxic as a long infusion are chamomile and black tea. Herbs that do make effective long infusions have the following properties: One, their medicinal constituents (phytochemicals) are primarily nutritive rather than stimulating/sedating. This is what gives nourishing long infusions their characteristic tastes: bland, sweet or earthy. Two, their medicinal constituents are best extracted into water (rather than alcohol, for example). There are many herbs to choose from, depending on your needs – see the list below. Each long infusion herb has its own medicinal properties, actions and uses in addition to its nutrition – choose one or more based on your health needs and your sense of taste. Nourishing long herbal infusions can be enjoyed on a one-time basis to provide nutrition, thereby improving your energy and performance for the day. They can also be used on a regular basis as part of a healthy diet. Some people like to rotate them for variety, while others stick with one herb over a length of time as a tonic to help treat a particular health condition (2 cups daily for a minimum of two months). It’s fine to add honey, milk or a pinch of cinnamon, and you can drink them warm, iced or room temperature – listen to your body’s preferences. Long infusions are easy to make (instructions included below), and one pound is enough for one month’s supply of two cups of infusion daily. Though they need to steep for a length of time, they don’t take any longer to actually make than a regular cup of tea. You may be surprised to discover that some family members take to long infusions happily and naturally, with their improved mood and resilience of benefit to everyone. One of my apprentices has a fifteen year old son who likes his oatstraw infusion so much he makes it for himself on a regular basis. I use long herbal infusions as my daily beverage, and when I don’t drink them, I can tell how much they help by what I am missing: energy, stamina, and steady nerves. Get your year off to a nourishing start by using the instructions below to make long herbal infusions for yourself! 1. Take one ounce of chosen dried herb (Your best guesstimate is ok if you don’t have a scale.) Rough guide: 1/8 to ¼ of a jar. 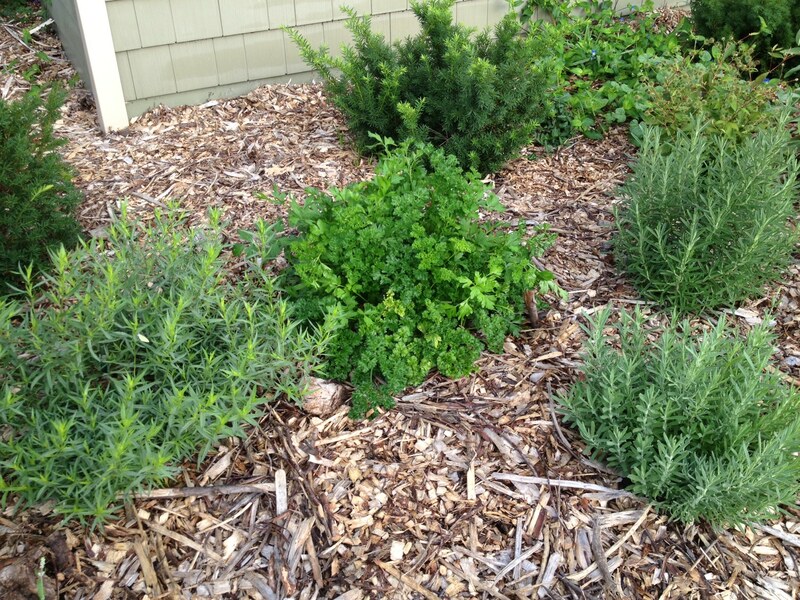 Less for finely ground herbs, less for heavier herbs like roots, more for fluffy herbs that take up a lot of room. 2. Place in a canning jar. Use a one quart jar for leaves (such as comfrey), or hardy flowers (such as red clover), one pint jar for roots, barks, or berries (such as burdock root or rose hips). 3. Cover completely with boiling water, stir with chopstick or knife and add more water until full. 4. Place lid on, and let sit four to eight hours for leaves or hardy flowers (such as red clover), eight hours for roots. Many people make their infusions in the evening and then strain them in the morning. 6. Infusions may be reheated (preferably do not boil, but still OK to drink if it does boil), iced, sweetened, milk added, etc. Some do well with salt or tamari, such as nettle. Most infusions contain large quantities of calcium, magnesium and other minerals, including trace minerals, in their most absorbable form. They also contain essential fatty acids, vitamins and protein. In addition, they each have particular medicinal qualities, actions and uses. Many nourishing and tonifying herbs can be used as long infusions, including Oatstraw, Comfrey leaves, Red Clover blossoms, Nettle leaves/stalks, Violet leaves, Linden blossoms, Chickweed herb, Burdock root, Dandelion root. When we got married Ernie was bringing home about £1 17s 6d. Now this was long before we went decimal so in todays money that would be about £1.25 a week, a couple of dollars to you Tess. Now, although everyone thinks that we have always had free healthcare in the UK that’s not so. A visit to the doctor when we got married amounted to just over half a months pay so it was pretty much out of the question if we wanted to eat. The National Health Service got started in the late 1940′s, before then we had to pay. Unless it was especially serious we relied on remedies passed down to us over the years, and most of the things we used involved plants, with the occasional bee added for good measure! Usually, someone local had what you needed if you didn’t grow it yourself. I went to teach the kids crochet again on Monday and we got around to the old days and ended up talking about plants. One of the girls said she really enjoyed her lesson in ‘herbology’. None of us knew if it was a real word, but we liked it so we decided to stick with it. As an aside, the crochet is going great but I have a feeling I am going to be inundated with scarves and knee rugs this Christmas. We used honey a lot back then, far more than most people use it now for medicinal purposes. We stored lumps of honeycomb in jars and the honey would collect at the bottom of the jar. A spoonful when you had a sore throat helped and it was one ‘medicine’ the children never minded. It also soothes coughs, putting a lining on the throat and helping prevent irritation. We also spread it over cuts and grazes to keep infection away and to help healing, it worked every time. Minor wounds would be lovely and clean and they really healed fast. Making a poultice helps bring out bruises and a burdock tea is excellent for treating indigestion. The root of the burdock plant was good for the treatment of boils. You boiled and mashed the root and placed it over the inflamed area. Drinking a tea made from burdock root was said to be good for arthritis…though none of us had it back then so I can’t be sure of that. Marigolds were used to treat bites and stings, you just crush them and rub them over the affected area and relief soon follows. These pretty flowers are a boon in the garden as they keep the aphids off tomatoes and other crops prone to blackfly like pole beans. Ernie ALWAYS planted a row of marigolds near our beans and the children used to put them in containers and move them around the tomato patch. I grew this in a few rotten at the bottom barrels down the far end of the garden, it takes over if you let it escape! Chamomile is very good at calming people down, and I used to make chamomile and lavender pouches to put in the childrens rooms to help them drift off to sleep. Chamomile teas can either be just drunk as a drink or held in the mouth to relieve toothache or the pain of mouth ulcers. Tansy is a pretty yellow flower that grows as fast as a weed if you let it, another one I contained in an out of the way corner. This stops the bugs biting very well, you just crush the leaves and rub them on your skin. Works a treat. You don’t eat or drink tansy as it’s poisonous used like that. 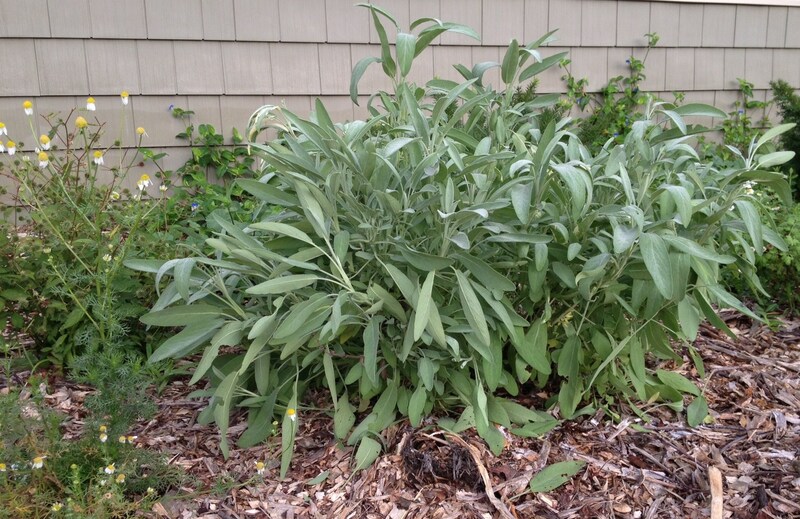 Definitely contain this plant…it will take over the entire garden if it gets a chance. as well as using mint in the kitchen it is very good for calming upset stomachs and preventing the children feeling like they are going to be sick. If there were lots of colds around I would add mint to tea without milk as it seems to help fighting the germs. Again, sage is great in the kitchen and almost as great for saving a costly trip to the doctors. Used as a bandage over the honey spread on a cut it is like a little natural bandage. It can also take the heat of burns, not open burns, but the fat splash or hot water type of burn that reddens the skin and makes it swell. Marjoram makes for a decent disinfectant. Pick lots, crush it up and boil it. The liquid kills germs. I’ll have to ask Edith if she knows where the box is that has all my old recipe books in. I had a few from mother when she died, all beautifully written out. I know there’s a notebook with them that lists all the medicinal plants my parents grew, and therefore the medicinal plants that I grew. I wonder where the box went? I’m sure we still have it somewhere. Paul and the children are coming over on Sunday, he’s a strapping lad, he can go up into the loft and look for my box if Edith doesn’t know where it is. Well, that’s it for today. You have a lovely weekend and I’ll speak to you soon. I’ve always loved herbs, even as a little child. In their kitchen, my parents have a cross-stitched hanging with the words, “Behold, I have given you every herb bearing seed,” surrounded by blocked images and the names of herbs. If my dad ever wanted to get me to squeal with delight, all he’d have to do is read the names of all the herbs in order, really, really fast. It got me giggling and clapping every single time! Garden sage *after* extensive pruning this morning. Chamomile to the left. 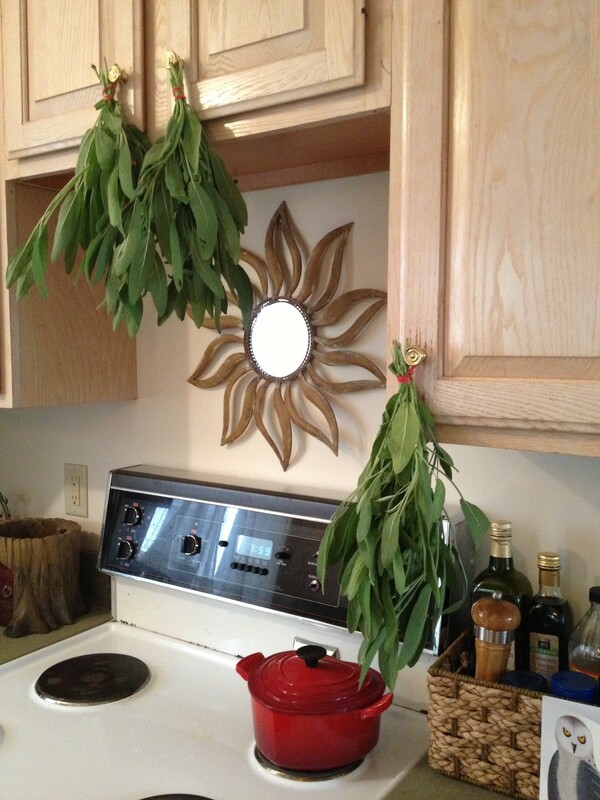 In fact, we have sage hanging all over the place right now as I attempt to learn how to make sage smudge sticks. 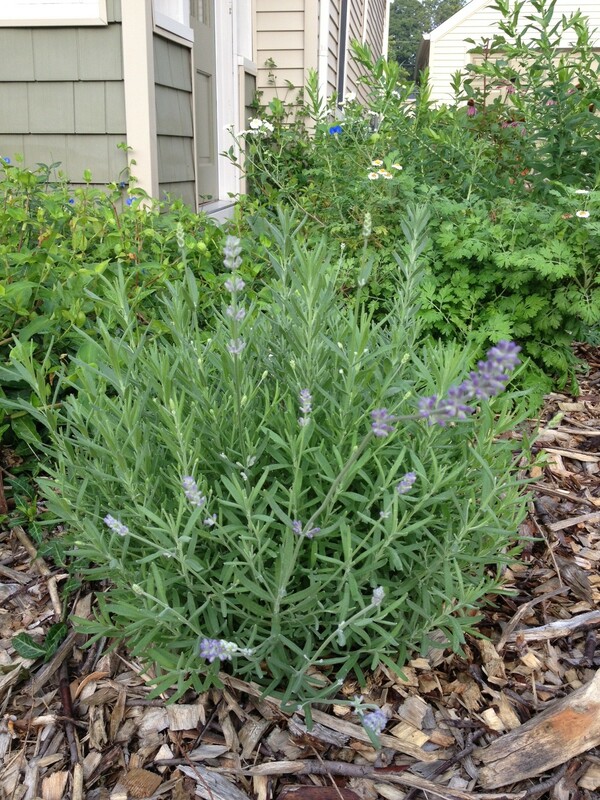 Various types of lavender have begun to flower all over the gardens. 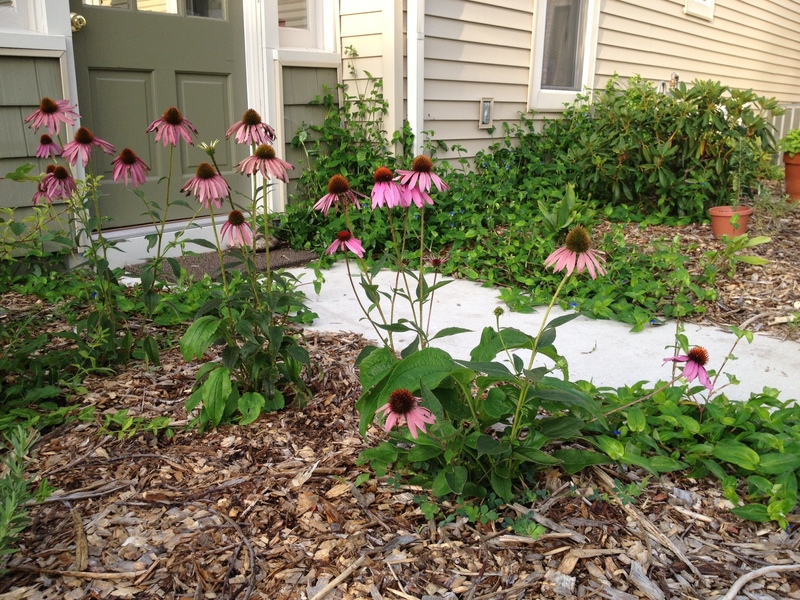 Purple coneflower (echinacea) is a favorite of the bees, although we have bees all over the gardens. I’ve never seen so many bees! I managed to get a second flowering on my yarrow. 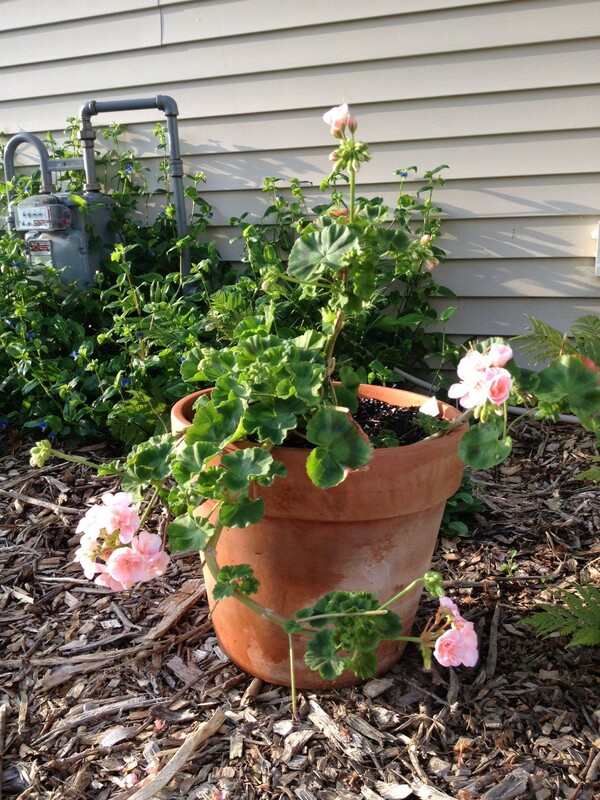 I’ve had this geranium for years! In the winter, she turns our kitchen into a garden. 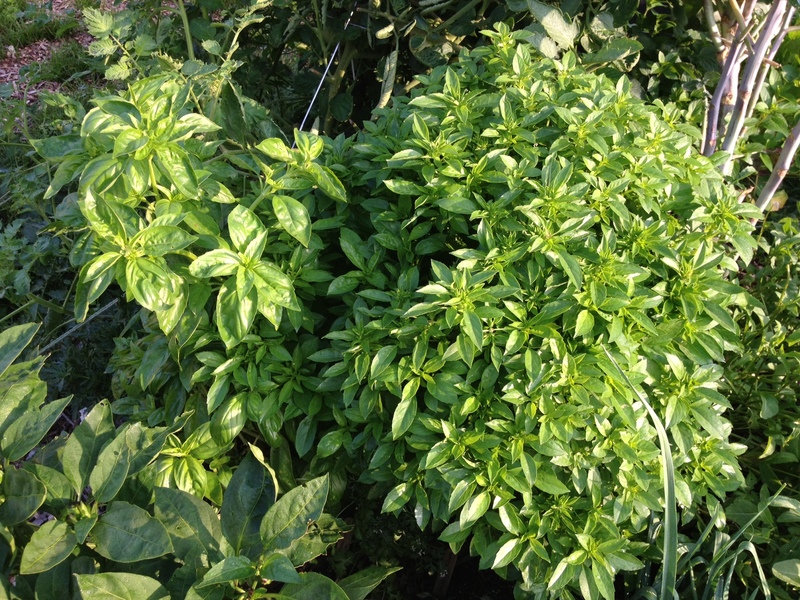 Italian basil and bush basil urge me to make and freeze even more pesto than I already have — a nice spark of freshness to cure the winter blahs. 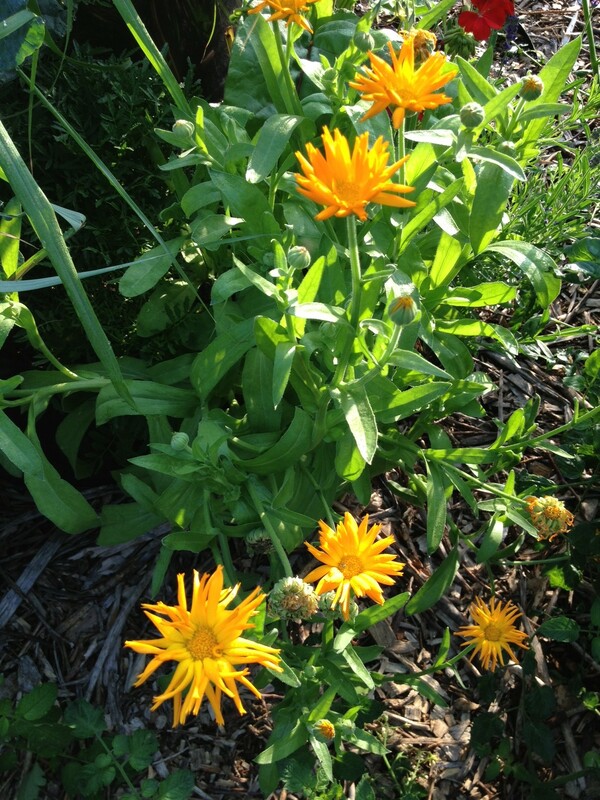 Calendula or pot marigold makes me so happy! I’ve tried to grow this before with only minimal success. This year, I’ve got calendula plants smiling in several spots, and they play nicely with red geraniums and lavender. Bees congregate here. 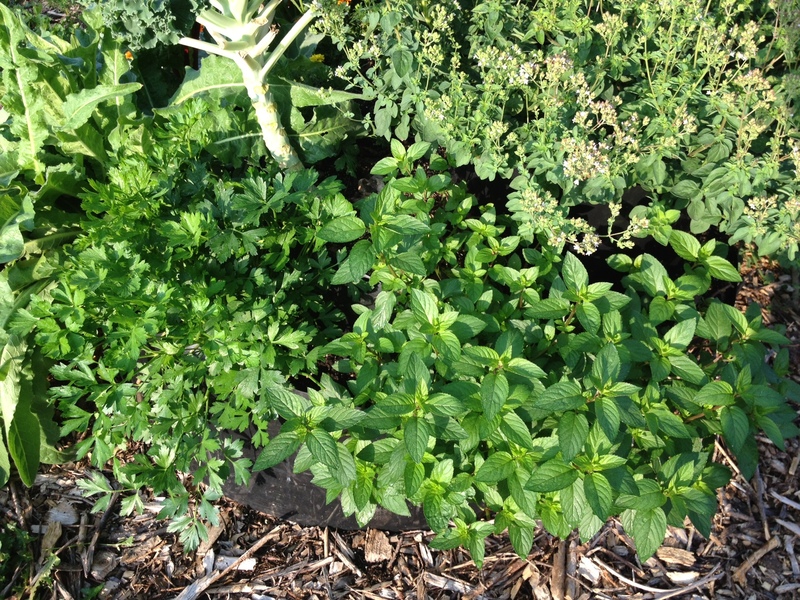 Besides their flavor and medicinal value, herbs have great personalities, and they are some of the easiest plants to grow. 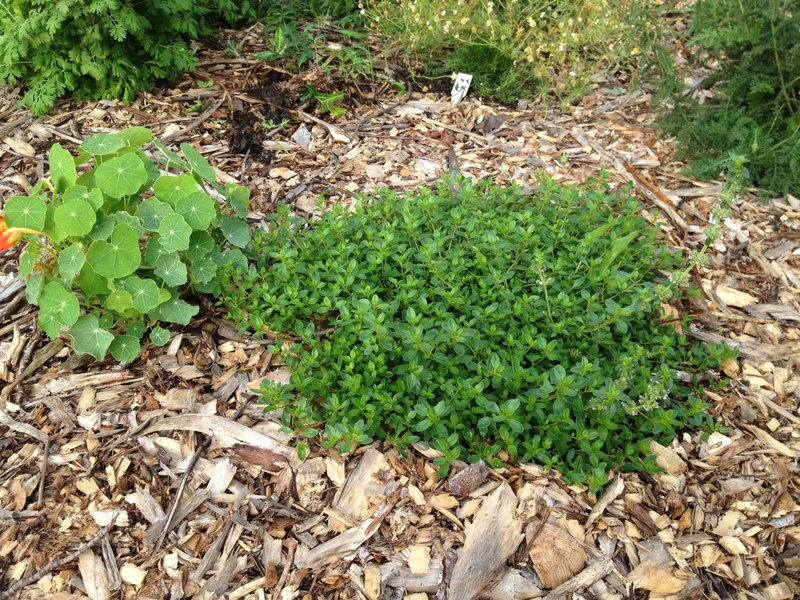 So easy, in fact, that they can quickly become weeds, hence containing my oregano, various mints and lemonbalm. I’m actually excited for some of these herbs to assert themselves. Many grow well in sandy soil and require little to no watering once established. I’ll be transplanting another garden sage from an InstaBed to the ground once I assemble our winter raised bed/cold frame combo — hopefully later this week. 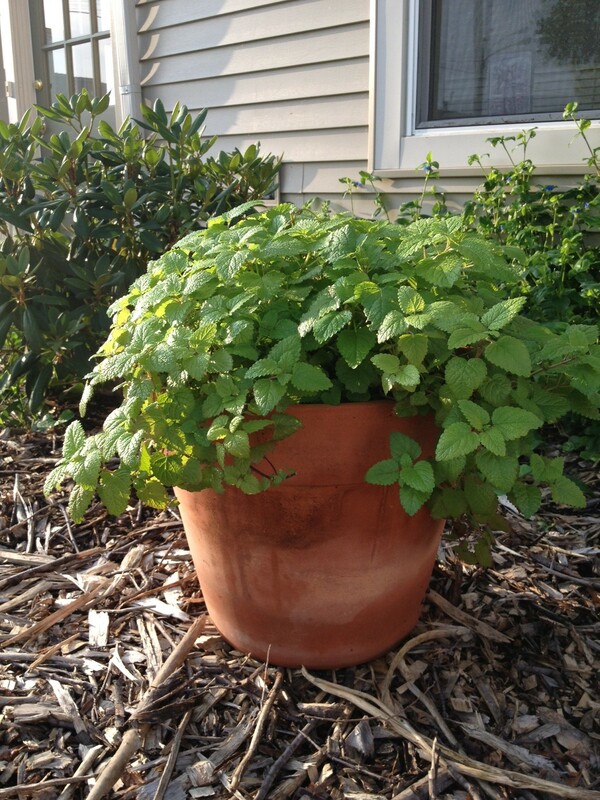 If you’ve never gardened before or fear you have a “black thumb,” try growing some herbs in pots on a windowsill or plant them in a sunny, neglected spot outside. 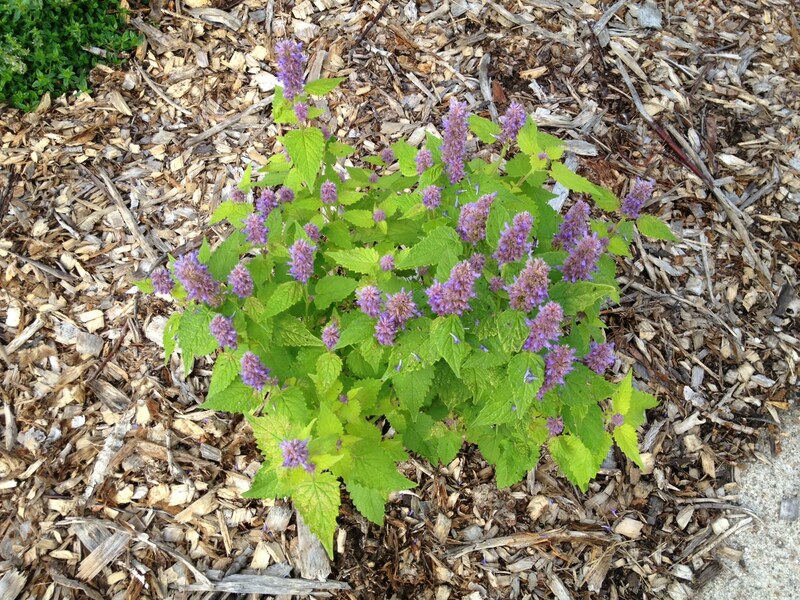 Many are perennials and will bring you beauty and flavor for years to come! I watched all five parts of this interview yesterday and loved them! “Herb Mentor” interviews Wise Woman Herbalist Susun Weed in a delightful conversation about plant communication, healing relationships with herbs, various traditions of healing, herbal regulation, and more. People really devoted to colon cleansing may not like part three, but she makes some excellent points about the importance of attitude in healing: do you need “to be fixed” or are you already healthy but looking to get healthier? Are you broken and filthy and can never become clean, or are you looking to add nourishment so that your body can enter into relationship with plants, people, food and the cosmos in order to tap into its own innate healing wisdom? I very much enjoyed both sides of this conversation, and I trust you will, too!